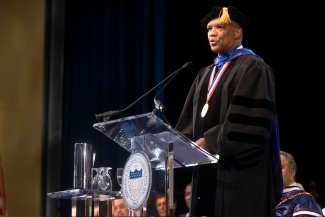 Former Premier, Dr. Ewart Brown, will be inducted into the Howard University Sports Hall of Fame next month. Included in the Hall of Fame initiates is Howard’s 1968 Track Team, of which Dr. Brown, a Howard graduate, was a member. "This honor by the University caught me off guard,” said Dr. Brown. “I am very happy for my teammates who deserve this recognition because they put Howard on the map as far as track and field was concerned. It is indeed special and I look forward to the ceremony next month." The new Hall of Fame initiates will be honored along with the Buffalo Soldiers awardees at a ceremony on November 16th, 2018 at Martin's Crosswinds in Greenbelt, MD. The Hall of Fame game is November 17th against Bryant University.